HALLOWEEN STORY STARTERS Freebie is a great little list of writing ideas and topics that you could incorporate into the writing center in your classroom. These HALLOWEEN journal topics will spark your students’ writing creativity! The HALLOWEEN STORY STARTERS could also be used for students that finish their work early. 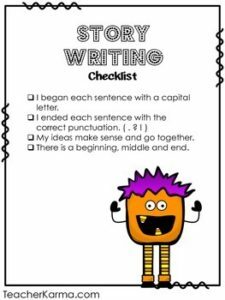 Included in this free resource is a Story Writing Checklist that can either be displayed in the classroom or added to their writing journal so your students may ensure they are including what is most important. If you are not already following me, PLEASE JOIN ME! I love giving away FREE products to my followers! If possible, please take a moment to leave some feedback for me. It helps me grow and keeps me inspired!